When I was in Melbourne I fell in love with these. Or these type of shoes/heels. At around $400 per pair I was too scared to try them on because I knew that I would buy them. I regret it now because they don’t have a retail outlet in Adelaide. 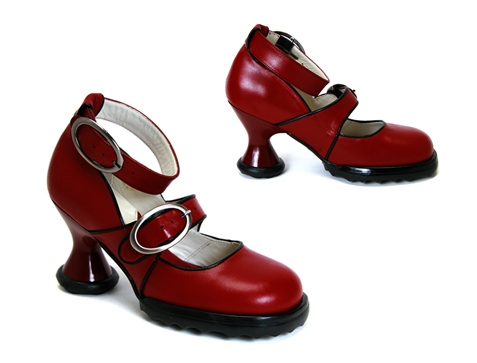 They’re John Fluevog shoes. I don’t normally wear heels but these are supposed to be really comfortable. My friend tried them on and she found them really comfortable, and like me, she’s not a heels girl. We walked out of the shop saying how fantastic the shoes were and continued shopping. The next shop we went into we were still talking about them and the shop keeper walked out from behind her counter wearing a pair and admitted to owning 17 pairs of these shoes. Wow, we thought, they must be good. I still think about the shoes and plan on owning a pair one day. I could order online but I’d still like to try them on first. But yesterday after taking JJ to see ‘Where the Wild Things Are’ I saw a pair of shoes that I ended up buying. 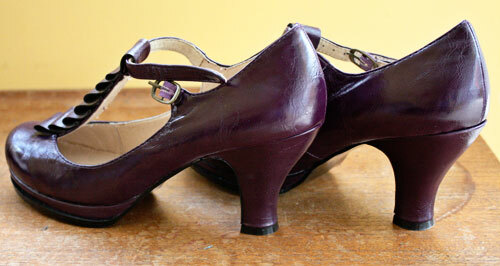 They’re not quite in the same league as John Fluevog but will be a good practise run for me wearing heels. They were even on special and didn’t cost me that much. I am not a shoe girl – but I am glad you got your fix! !